This is the headstone of Sylvester Stadler in the Königsbrunn Friedhof, just south of Augsburg, Germany. 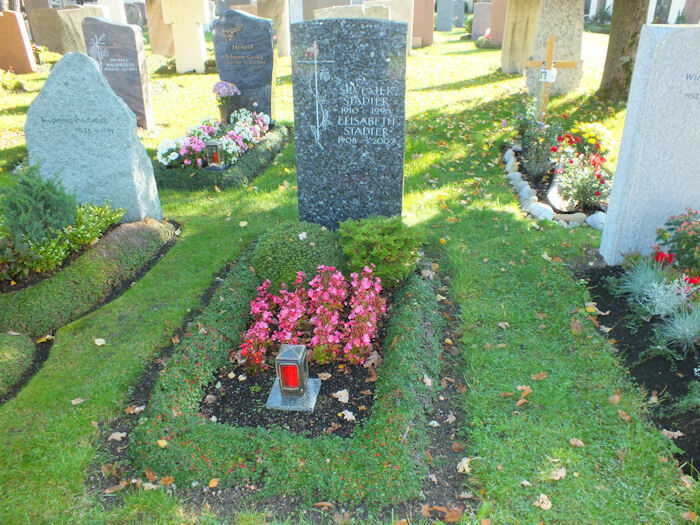 It is notable that in this instance the Stadlers do display a Christian Cross symbol on their headstone. During his service with the SS, Stadler did declare himself to be unaligned to any branch of the established church and that he was "Gottgläubigkeit" as did so many other members of the SS. It does seem now that he subsequently changed his mind on the subject and rejoined the church by the time of his death. By way of comparison see the grave of Otto Weidinger, who succeeded Stadler as commander of the Der Führer 4 days after the attack on Oradour. Stadler who was the commander of the Regiment for some time prior to the 10th June and left to become the commander of the 9th SS-Panzer Division Hohenstaufen on the 14th June 1944, must have known the full story of Oradour from the German point of view. Stadler was born on 30th December 1910 at Fohnsdorf, Austria and died 23rd August 1995 at Königsbrunn Germany.